Kennett High School will present its annual musical March 10 – 12. This year’s production of the show Beauty and the Beast includes a cast of seventy-eight Kennett High School singers, actors, and dancers. Ms. Katie Soukup is the music director, and Ms. Cindy Albertini is the stage director/choreographer. Ms. Julie Bolten serves as the play’s costume designer and coordinator, and Mr. Michael Anastas will manage the lighting and sound crews. Mr. Anastas will also supervise the stage crew with Mr. Steve Dooley and Mr. Steve Castleton. Adapted from a French fairy tale, this show, with music by Alan Menken, lyrics by Howard Ashman and Tim Rice, and a book by Linda Woolverton, first appeared on Broadway in 1994. The musical is the tale of Belle (Olivia Pagliaro), an independent, intelligent woman in a provincial town, and the Beast (Alex Mark), a prince transformed by an enchantress’s spell as punishment for his selfishness. In order to become human again, the prince must learn the meaning of love. If he does not, he will remain transformed for eternity, along with the comedic and clever members of his household: Mrs. Potts (Aubrie Barnett), Lumiere (Danny Drennan), Cogsworth (Jimmy Rosser), Madame de la Grande Bouche (Sami Castleton), Chip (Tamblyn Mitchell), and Babette (Lilian Alba). Filling out the cast of characters are the town hero Gaston (Austin Maxwell) and his sidekick Le Fou (Ben Skross), Belle’s father Maurice (Colin Petersen), the Silly Girls (Pearl Battalora, Abbie Duckworth, Becca Shoemaker, and Alie Weldon), Madame D’Arque (Diane Brunke), and the Prologue Voiceover (Duncan Smith). Members of the ensemble include Ileana Alfonso, Samantha Anthony, Megan Appleby, Camille Avedisian, Kassie Ayllon, Amanda Bell, Grace Bolten, Langdon Braden, Madison Brown, Casey Bruno, Kamryn Bunker, Francesca Caccamo, Avery Chapman, Hannah Church, Heather Cooper, Gabbie Crowl, Kaitlyn Devonshire, Olivia Donia, Claire Duckworth, Erin Duffy, Zhuanel duToit, Kevin Fiss, Emily Funkhouser, Jennifer Gau, River Gheen-Regouski, Emma Giancola, Holly Gouge, Allie Hall, Lauren He, Anais Jevtitch, Connor Lang, Peter Magasiny, Emily Mallon, Cassidy Matz, Maddy McFarland, Gabby Mento, Hannah Mourad, Dylan Munson, Bea Murray, Natalie Nellius, Suju Park, Caleb Pebly, Lydia Pebly, Laurel Petersen, Mirella Petrillo, Liz Rauscher, Alicia Rohrer, Maggie Schubert, Julia Sharp, Evan Shinn, Ananya Shivakumar, Sydney Shumaker, Morgan Slaninko, Arielle Smith, Samantha Sullivan, Kate Taylor, Emily Thompson, Damian Whyte, Anna Wilson, Jenny Zavala, and Cindy Zern. Show times are Thursday, Friday, and Saturday at 7:30 PM. There is also a Saturday matinee at 2:00 PM. Tickets may be reserved by clicking below or purchased at the door. Kindergarten registration for the 2016-2017 school year will begin on Tuesday, March 1 and continue through Friday, March 31, 2016, with the exception of March 21 through 25. Parents can pick up a registration packet at the main office of the Mary D. Lang Kindergarten Center after February 15, 2016. 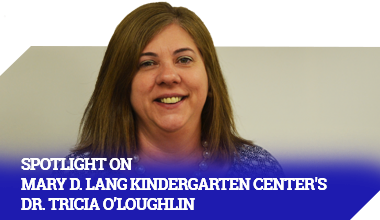 Parents new to kindergarten for the 2016-2017 school year are invited to Mary D. Lang’s “Kindergarten Kickoff” for an information session and building tour to be held at the Kindergarten Center on Thursday, March 3, 2016, for parents whose last name begins with A – M and on Thursday, March 10, 2016, for parents whose last name begins with N – Z. Both sessions will begin at 6:30 p.m. The 2016-2017 student school year will begin on Monday, August 29, 2016, and is tentatively set to end on Thursday, June 8, 2017, dependent on the need for inclement weather make-up days. The winter holiday will run from Friday, December 23, 2016 through Monday, January 2, 2017, with school resuming on Tuesday, January 3, 2017. Spring break will be Monday, April 10 through Friday, April 14, 2017. Graduation is scheduled for Friday, June 9, 2017. Six (6) inclement weather days are added to the end of the school year. There are five days designated as “local holidays” in accordance with the ruling of the Department of Education. The designated local holidays are Monday, January 16, 2017 (Martin Luther King holiday); Monday, February 20, 2017 (President’s Day holiday); and Monday, April 10 through Wednesday, April 12, 2017 (spring break). The Kennett Consolidated School District is pleased to welcome Dr. Yvette Line-Koller as the new director of special education. Dr. Line-Koller joins the Kennett Consolidated School District from the Warwick School District, where she most recently served as the director of student services. Dr. Line-Koller is a graduate of Shippensburg University where she earned her Bachelor of Arts in psychology. After graduating from Shippensburg University, Dr. Line-Koller started working in the psychology field where her position required her to work alongside educators. After experiencing the impact that educators can have on students, Dr. Line-Koller knew she wanted a career that combined both psychology and education. Inspired and ambitious, Dr. Line-Koller received her master’s degree in school psychology from Millersville University and her doctorate in education administration from Immaculata University. She then began working as a school psychologist for nine years in the Lebanon School District before becoming the director of student services for seven years in the Warwick School District. Dr. Line-Koller is thrilled to be a part of the Kennett Consolidated School District. She admires the vibrant and diverse schools and community. As the director of special education, Dr. Line-Koller established a goal to build capacity within the Kennett Consolidated School District in order to educate each student to the best of the District’s ability. She also plans on building programs to provide all students with opportunities to stay in the community. “A like-minded commitment to the mission of the Kennett Consolidated School District, ‘to provide a quality education that increases the achievement of every student,’ is what brought me to be a part of this educational community. Along with my commitment to the mission of the KCSD, I am also focused on creating partnerships between the school, families, and community; cultivating an atmosphere where every person feels valued and secure; and removing barriers to learning for each and every student. I look forward to working with students, staff, parents, and community and the opportunity for us all to grow together,” Dr. Line-Koller explained. Dr. Line-Koller resides in Lancaster County with her husband and two daughters. In her free time, Dr. Line-Koller enjoys running, reading, and — most importantly — spending time with her family.